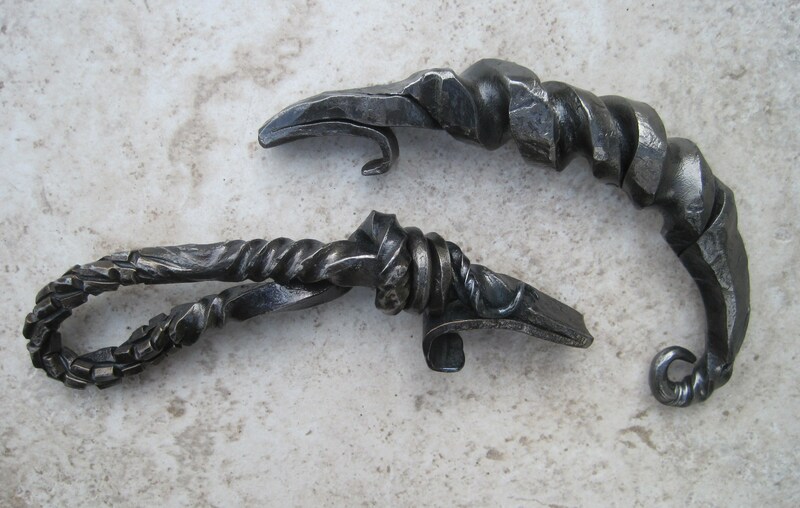 These hand forged bottle openers are based on the “Bio-Mechanical” creature from the ALIEN movies. I created these sculptures with the intent of making them disturbingly beautiful. They were forged while I was in a bad mood. So there’s a lot of anger hammered & twisted into them. They ain’t made for no sissy. They’re heavy, rough to the touch, nasty and dangerous looking and created in a fire with anger and hate. So maybe they are cursed. Then maybe they’re just ment for someone who’s been through the ringer and has a story to tell that matches the twists, scars and hammer marks on this chunk of metal. You can purchase these Bottle Openers by clicking HERE.